1. Biskvit je iz recepta za Ličku pitu by cvijetic8 napravljen jedamput i pečen u kalupu promjera 26 cm 🙂 btw. genijalan bisvit !! 2. Voće staviti u posudu za kuhanje, dodati šećer i kuhati dok ne ispusti tekućinu te dodati malo gustina da se zgusne. Pustiti da se malo ohladi te pomiješati sa mascarponeom i dodati želatinu pripremljenu kako piše na vrećici. Ostaviti da se ohladi kroz noć u hladnjaku! 3. Ganache kremu pripremiti tako da vruće vrhnje za šlag prelijete po čokoladi, ostavite per minuta pa promiješate i ostavite preko noći da se stisne. 4. Drugi dan biskvit prerezati na pola, prvu polovicu premazati ganachom, pa kremom od šumskog voća i mascarponea pa opet ganachom te na to staviti biskvit. Premazati cijelu tortu ostatkom ganacha te ukrasiti šlagom i voćem po želji!! I looove this pic! First add the mascarpone to the fruit and leave in the fridge over night! 1. For the cake – mix the egg yolks with sugar until it’s puffy, add grated orange rind and vanilla sugar. Slowly add the flour with baking powder and milk and oil. Mix the egg whites until stiff peaks and add to the yellow mixture. Bake in a round mold diameter 26 cm for 30 minutes on 180 degrees. The finished cake should look like in the pic above! 2. Then prepare the fruit – put the fruits and the sugar in a bowl an heath up until the fruits let all the juices out. Then add a little bit of cornstarch to make it thicker. Let it cool a little bit then add mascarpone to it! 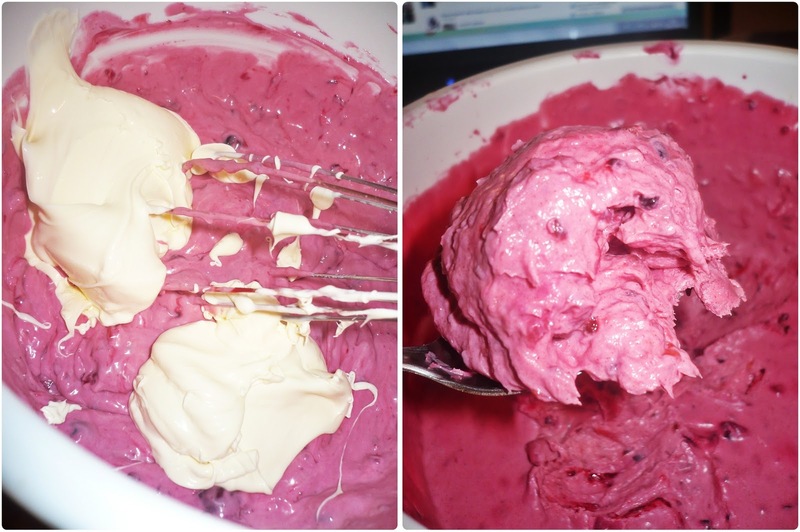 It should have a nice pinkish color :)) Let it cool an thicken in the fridge overnight! 3. Make the ganache – pour the hot whipped cream over the chocolate. Let is sit for 5 minutes then stir and let it cool in the fridge overnight! 4. The next day – put everything together! First devide the cake in 2 pieces and put one on a cake stand. Glaze it with the half of the ganache and then the fruit cream (leave a little bit for decoration)! Then again the rest of the ganache and finish of with the second layer of the cake. Decorate it with whipped cream, mascarpone cream and the fruits as you wish. Evo je 🙂 gotova 🙂 iz svakog kuta! Just look at the little white dot on the mascarpone cream 🙂 adorable! Are you ready for the cake slice? It look better then i thought! ooo, and the book I bought on the fair! That cake looks incredible. I'm terribly at decorating baked goods, but, your post makes me want to try my hand at it again! Odlicno ti je ovo iznenadjenje!!! Ludo izgleda…ima još koja fetica za mene? Prekrasna torta ! Volim ovu kombinaciju a napravila si je izvrsno ! Prava rođendanska. Djedu želim sve najbolje !! super si ga počastila i razveselila. Super za shoppping na Interliberu, lijepe knjigice si izabrala. Looks like an awesome cake. I would love to try some! This looks like it was fun to make with all those beautiful colors. Beautiful pictures, cake and decorating of the cake! Have a great weekend! Ohhhhh, how I LOVE your creations and your blog!!!! Seriously!! I can't tell you how much I love everything about it! And your photographs — fantastic!!!! Your blog is one of my absolute favorites!!!! Thanks for putting all that time and effort into it!! waaaaaw ….još jedan kuharski blooog… supeeer:) ja isto volim kuhati i praviti kolače, cupcakes, muffins….sveee:) ….moj blog je pola kuharski:) hehe…. pOZDRAV!!! !